The American Roadside - News, memories & musings on the great American roadside experience. News, memories & musings on the great American roadside experience. It was around 1993 when I first encountered the SCA, though the roots of the organization go back to the mid-70s, around the time I was graduating from college. I don’t recall how I stumbled on the group, but I will be forever grateful that I did. Founded by like-minded people who had a passion for the American roadside, in particular its quirky architecture and culture, the group has been a steady force in trying to advocate for the preservation and scholarship in this area. Just last week I was elected to the Board of Directors of the SCA and I am thrilled to be able to jump in with both feet and lend a hand. Plans are afoot for another tour, but the details are not ready to be released as of yet. At least some of you may have been part of these great events in the past. My first was the Delaware Diner tour, followed by the South Dakota event a year later. The cave image above is from that wonderful event which was based out of Rapid City. So here’s hoping you’ll want to jump in and join us as well. We’re always looking for new members like you, the kind of folks who are always up for a — road trip! Our traditional image. This was the Lawrenceville section of Pittsburgh about 15 years ago. Today, the neighborhood continues to tradition into a more genteel area, chock-a-block with the “creative class,” new restaurants and small businesses. Along with East Liberty, it was something I never thought I’d see in my lifetime. You can argue the merits of gentrification, but was there any other choice? The onetime Fish Tale Diner, which sat for many years across the Merrimack River from Newburyport, MA in Salisbury, is now only a memory. As you can see in this photo, the area where the diner once stood has now been leveled. 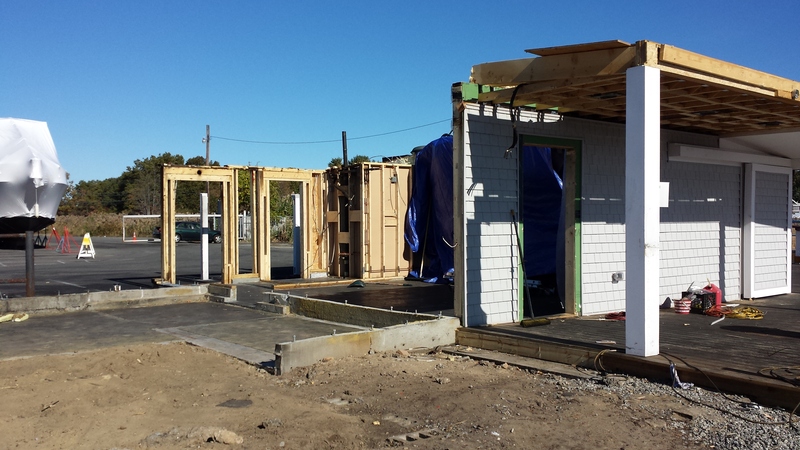 The remaining walls are part of an add-on that was done over the past couple of years. As Larry Cultrera noted in his Diner Hotline blog, the Fish Tale had recently been damaged by a fire. No word on what if anything was salvaged from this very original Worcester Dining Car, but suffice to say that you can scratch #762 off your list of extant Worcester cars. Larry has the history of the diner here and the more recent fire update here. This place (recently renovated) was right next to my Savannah rental of a few months ago. OK. I’ll admit that this is sort of a click bait site, but it is really quite interesting and, as a bonus, you don’t have to go from page to page — just scroll down. Fast forward. Today was the tenth anniversary celebration of the museum in its new digs just west of downtown, hard off of I-75. The larger space (and there is more available) is beautifully conceived and the interpretive information is just enough to help the average visitor get a handle on how signage has developed and changed over the past hundred years or so. I share an odd connection with Tod Swormstedt, who is the driving force behind this unique museum. Some years ago, a lovely woman by the name of Jane Powell, contacted Tod about early poster and “show card” artists. She and her daughter Lori were trying to dig up more information about the painters and artists who had painted one-off movie posters in the early part of the 20th century. One of those artists happened to be my grandfather, the wonderful R. J Rogers. (Renfred, for those who care) Tod’s family happened to own the industry trade magazine “Signs of the Times,” in which my grandfather had advertised aid for others who were painting movie posters at the time. 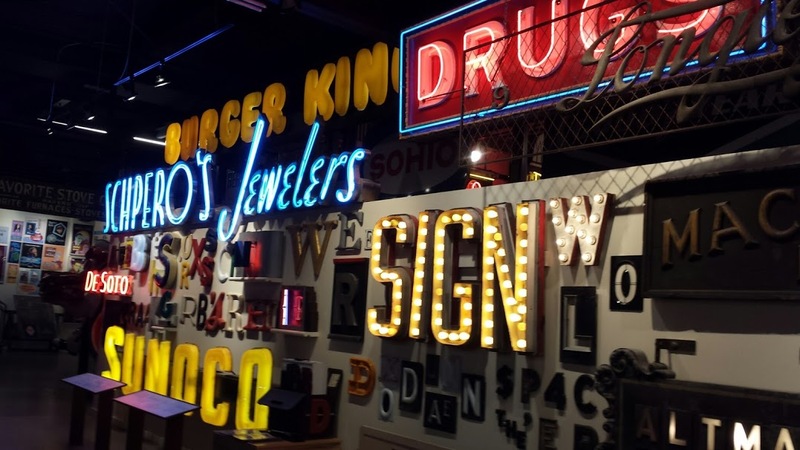 Personal feelings aside, The American Sign Museum is a gem… My congratulations to Tod and everyone else involved. Now that so much of our roadside has been lost, there is, at least, this one place where you can walk back through a glittering American that existed — not too long ago. It isn’t that often anymore that you simply stumble on a long-lost relic of the American roadside, but so it was this weekend when I visited Ellicott City, Maryland. On my way to the Double T Diner, I looked up to see Old King Cole beckoning with his outstretched arm for me to enter The Enchanted Forest. Well, the Enchanted Forest Shopping Center, anyway. Upon return, I did some research, and discovered that this once-charming children’s park was the second “theme park” to open in the U. S., after the original Disneyland. The year was 1955. Those post war years when everything seemed to promise a sort of storybook future. Well, you know the rest of the story. Eventually, as the area grew, the park was downsized, sold off and closed. You’ll find other Enchanted Forest info here and here. There are some classic, notable diners in the bunch; The Miss Worcester, Mickeys, Tops, but also a whole raft of wannabees and neverweres. My fav amongst that group is “Slim Goodies,” which, we are told “…has been serving up creole goodness for nearly 12 years.” Really? Twelve whole years? That makes it a classic in my book anytime! For our part, if we had to pick one diner in Worcester to highlight it would have been the venerable Boulevard, not Miss Worcester, despite that diner’s close connection to the Worcester Lunch Car Manufacturing Company. The Roadside, In the Rearview Mirror…. It has been a long time coming, but it was always inevitable, particularly in a nation which seems to value “new and shiny” over just about anything else. I’m speaking of the general state of the American roadside at this date and time. Though much that we love remains, much has been lost, and continues to be bulldozed each year. Just try finding a classic old motel in your corner of the nation, or a diner, or a drive in. Most of the motels have been swept away in an almost manic building spree led by the Hiltons, Holiday Inns and Marriotts, who now manage a diverse group of properties, each aimed at a certain niche in the market. Fran and Bill’s Motel is, for the most part, a distant memory. Was that always the way this was going to go down? I suppose so. Many early mom and pop motels were (generally) thrown up quickly and cheaply. As American’s took to the roads, particularly after WWII, the need arose and it was filled. But it wasn’t long before the Holiday Inn, with its “great sign” began to challenge the independent operators. So, what to do? Well, the only option is to get out there and find what’s left! There are still a lot of small businesses hanging on, but it’s always a question of just how long. When you drive by them the next time — you may see only a pile of debris. So, don’t delay. Hit the road. Today or tomorrow or this weekend, but do it! Now. Welcome back to The American Roadside. In just a few short years, much has changed along the road, and much of it has been for the worse. Whole swaths of the old American roadside has been obliterated. Just try finding a small, mom & pop diner anymore or a motel, other than in a 1930’s movie on TCM. They have been bulldozed. And, unfortunately, many of the memories have been buried in the rubble with them. However, all is not lost! For my fellow travelers along that long stretch of macadam, there is still a lot to be seen and appreciated. It’s good to be back on the road!